It’s funny that you mention special guests. 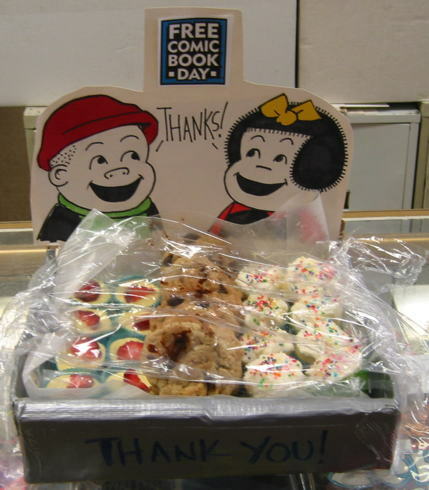 In my previous post I mentioned trying a few places before finding that one magical spot (Comicopia in Kenmore Square, Boston, MA. I’d never been there before, but the people there were great!) and the other places all had guests. There were actually some name people, but even without them there were some local artists who were just there to do commissions. Which is neat, but these aren’t big stores! Between two artists and a table for free comics, there wasn’t a lot of room to move around. All in all it was a great day and I forgot how good a bag full of comics smells. I’ll definitely get into FCBD next year and use it as a day to splurge on graphic novels again. 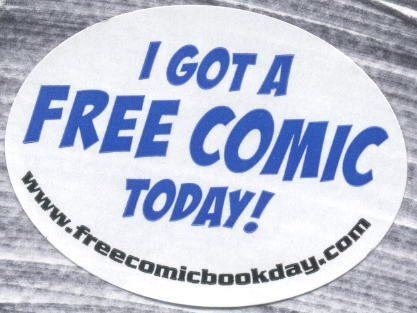 I enjoyed coming to the store and getting my free funnybooks, as well as partaking in the nice sale on graphic novels and collections. It’s also good to see the band back together with Tim & Aaron showing up to make me feel about 5 years younger…always a good thing when you’re on the downhill side of 40. I’m also happy to hear that Seth is on board with growing the event at the store. I keep hoping that you will get someone to do signings at future events. As for the comics, I loved the Atomic Robo and Mouse Guard books. The Tick was decent. The Walking Dead book was surprisingly good, as it was new material (basically backstory about several characters). Scratch 9 also amused. Weirdly enough, I did not like the Prince Valiant book (I’m a old comic strip fan), because it feels like the artist draws men to look like women in drag (seriously, after thinking about it, my wife & I concluded that Prince Val looks like Joan Crawford). It was such a fun event, Mike! So beautifully organized! When I was there it was packed, with a line out the door..but everyone knew where they were going and was happy to wait for all the fun free goodies. Saw some familiar faces, cute kids with capes, and more things to buy. 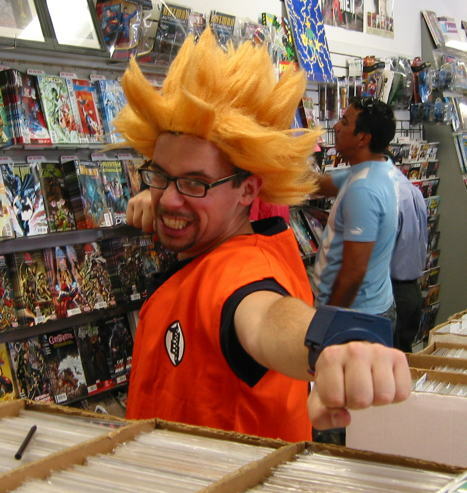 I actually *avoided* my local comic shop on Saturday. 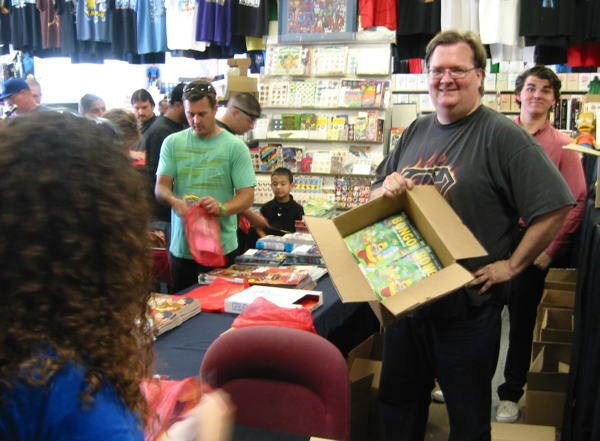 I was in town with my one-year-old, remembered I had some holds I needed to pick-up and had some pleasant memories of dropping by during FCBD a few years ago when there was a little crowd but nothing too bad. However, my experience visiting a record store on vacation a couple of weeks ago — and figuring out that it was Record Store Day based on the dwindled stock and the line around the store’s perimeter — made me call ahead first, though. 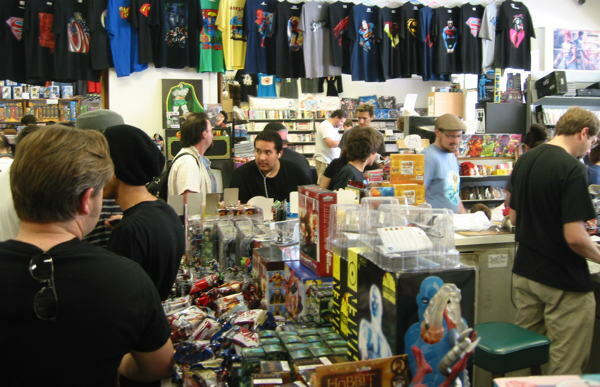 Sure enough, they were swamped — not the best day for a baby’s first visit to a comic store. So instead I’ll be trying to go on a Tuesday. So when are you going to found Free Pog Day…? Well, he IS the Future of Law Enforcement. Mike, you should be writing comics and books. You are a very good writer and extremely witty. You’d be a natural. Tip of the Hat to Mr. Sterling, et al at the Progressive Ruin. 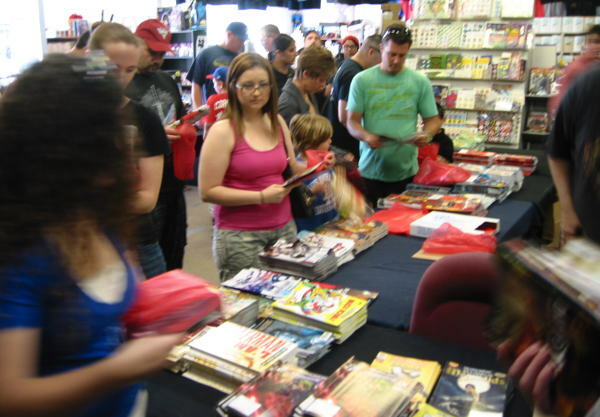 Our local FCBD was a great event, and all the comics we got were age appropriate (had a near mishap with “Grimm” but the clerk caught it — shook his head and said it wasn’t what we were looking for).